This multiple laptop case is a standard Parker Plastics Roto Rugged Case that has a customized foam interior to fit your laptops and accessories. 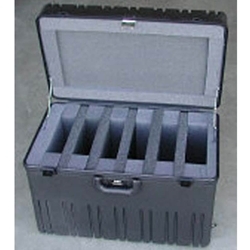 This case measures 18" x 14" x 14" before the foam is customized and inserted into the case. This case comes standard with 2 recessed edge casters and a telescoping enxtension hangle and easy mobility. It can fit 5 laptops up to 12.5" x 10.5" x 1.5" with an accessory storage area of 11.5" x 3.25" x 8". This is just the standard configuration for this case, and it can be adjusted in order to fit more or fewer laptops, or it can even be changed to fit smaller laptops. For other customizable options please give an Atlas Case salesperson a call. Interior Dimensions17.75" x 14.3" x 12.75"
Exterior Dimensions19.75" x 15.75" x 15.5"
Shipping Dimensions22" x 17" x 17"